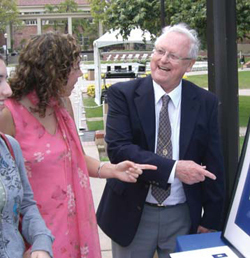 Herbert D. Kaesz, professor emeritus of chemistry and biochemistry, died 26 February 2012 of cancer in Los Angeles. He was 79. He was born in Alexandria, Egypt, to Austrian parents. His father, a chemist, was asked to join his wife’s family business, Kurz Optical, to run the branch in Alexandria. Later, the family immigrated to the United States when the younger Kaesz was seven. After receiving his AB from New York University, Herb went on to graduate studies at Harvard University, receiving his Ph.D. in 1959 under the mentorship of F. Gordon A. Stone. He joined the UCLA faculty in 1960 as a member of the inorganic division. He retired in 2003, but remained an active emeritus right up until his death. Herb Kaesz at a fairly recent initiation ceremony of the Phi Beta Kappa UCLA Chapter. Kaesz was president of the Inorganic Syntheses Organization, which publishes the Inorganic Syntheses book series (He served as editor of volume 26 in this series.) and served for over 30 years as associate editor of the ACS journal Inorganic Chemistry. His accomplishments were honored by the scientific community many times over the course of his career. In 1980, he received the Tolman Medal from the Southern California Section of the ACS and in 1981 he was elected a Fellow of the AAAS. In 1998, Herb received the ACS Award for Distinguished Service in the Advancement of Inorganic Chemistry and was elected a Fellow in 2009. Herb was also a member of RCS and Alpha Chi Sigma. Kaesz performed vital service for the chemistry community. In IUPAC, he was chairman of the Commission on the Nomenclature of Inorganic Chemistry from 1998 to 2001—and a member since 1994. He was also a member of the Inorganic Chemistry Division, the Chemical Nomenclature and Structure Representation Division, and the Committee on Chemistry Education. He became an IUPAC Fellow in 2006. Herb served on the U.S. National Committee for IUPAC in various capacities for 11 years and as chair of the committee from 2007 to 2009. As a member and Fellow of IUPAC, he served the international scientific community by bringing his expertise in inorganic chemistry to bear on a variety of projects, though he had a particular interest in chemical nomenclature. As a scientist, he supported and developed international collaborations through visiting professorships in France and New Zealand, and was recognized with a fellowship from the Japan Society for the Promotion of Science (1978). In 1988, he was a winner of the U.S. Senior Scientist Award from the Alexander von Humboldt Foundation, sponsored by the German government (1988). As a member of USNC/IUPAC, Kaesz brought his commitment to global science and to the value of collaboration to the activities of the group, along with a warmth and kindness that made him a pleasure to work with. His vision to engage young Americans in the global chemical enterprise by providing them opportunities to dialog and exchange ideas will be forever championed. His skill, talent, dedication, vision, and passion for our chemistry community will be truly missed. We, in IUPAC, were very fortunate that he chose to get involved with the international community the way he did. Herb, you did chemistry and chemists a great service.